Spatchcocking a Turkey is Well Worth It! A few weeks back I wrote about spatchcocking poultry. I tried it with a chicken and cooked iron my grill as a practice session for my Thanksgiving turkey. I was a very special chicken! This was a very wonderful Thanksgiving with lots of new dishes and great help from my daughters, Mande and Emily, who helped make it special for our family. Spatchcocking involves removing the backbone completely from the bird, turning it over and scoring beside or removing the keel bone. Splay the back and press down firmly on the breastbone until you feel and hear it crack. You then can cook the bird flat. Years ago I would have called it butterflying the fowl, but spatchcocking is much more fun to say! I dutifully purchased a 14 pound bird and set it in the fridge for five days to thaw. The night before Thanksgiving, I did the deed and rubbed they bird with a dry rub made from toasted anise see, grated orange zest and kosher salt. The bird rested on a rack, uncovered in the refrigerator overnight. I was supposed to wash the rub off the bird, but I chose to rub it off with paper towels following Thomas Keller’s advice to let the bird sit uncovered for six to 18 hours in the refrigerator to dry the skin a bit. Ready for the oven, the bird lies flat on a bed of root vegetables, heads of garlic and sprigs of thyme and rosemary. I’ll need a slightly larger pan before the next turkey. The turkey starts out with a basting of olive oil, toasted anise seed and strips of orange zest. It starts out at 450 for 30 minutes; then the temperature is reduced to 350 and basted every 20 minutes until an instant read thermometer in the thickest part of the thigh reads 165. 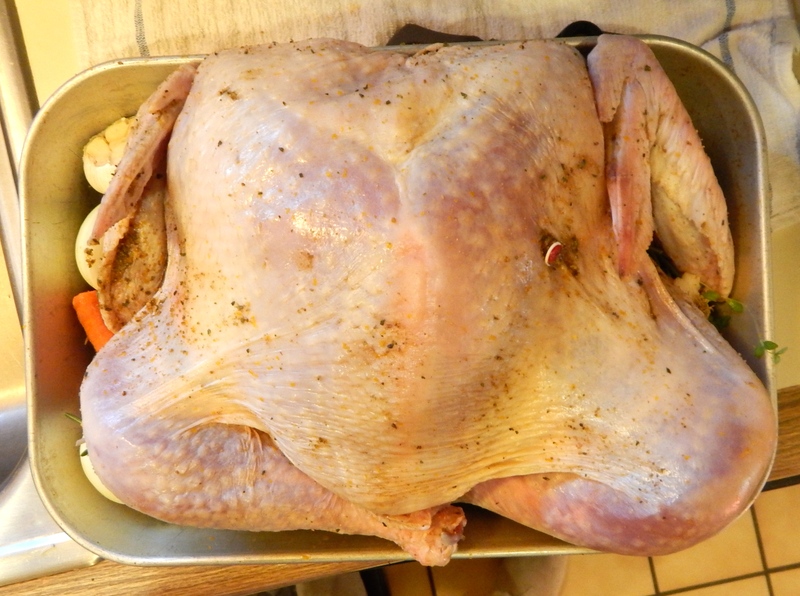 Remove the turkey from the oven, tent it and let it rest at least 30 minutes before carving. My 14 pound bird was done in just over two hours. Just out of the oven, spatchcocked turkey with wonderful golden bronze crisp skin. The delicate sent of anise and orange made me want to rip off a leg or wing and start in. Remove the wings and the thighs. Separate the legs from the thighs. 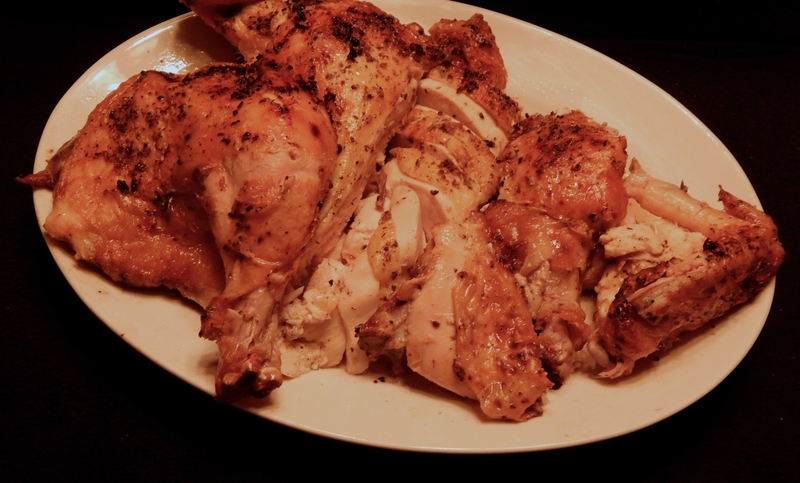 I carved the thighs for the dark meat fans at the table. I left the legs whole for the presentation. You can easily remove each breast half intact and slice it on the platter. Crisp skin, juicy white meat, succulent dark meat ready to serve. This may have been the best turkey I’ve had in years. It certainly has made me a fan of spatchcocking. I’m still playing with the cast iron skillets. 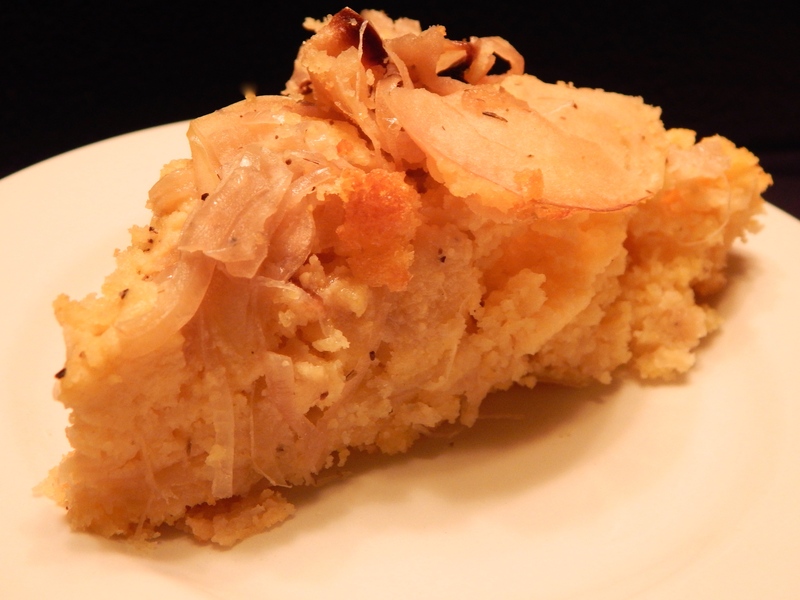 One of the recipes that got me started on this kick was for cornbread with caramelized apples and onions. It was intriguing, to say the least. I used my multi-use cast iron skillet, not the one for cornbread only, since I had to caramelize the onion and apples in the pan. After the onions softened and took on a little color, I added paper thin slices of Pink Lady apples. When they softened and began to give up their moisture, I added granulated sugar and died thyme, and stirred it all together. I try to follow a recipe exactly the first time for a baseline flavor assessment. I used all butter for the shortening in the cornbread and three tablespoons of sugar in the batter along with buttermilk and eggs. It is no wonder that this cornbread clocks in at 400 calories a slice! 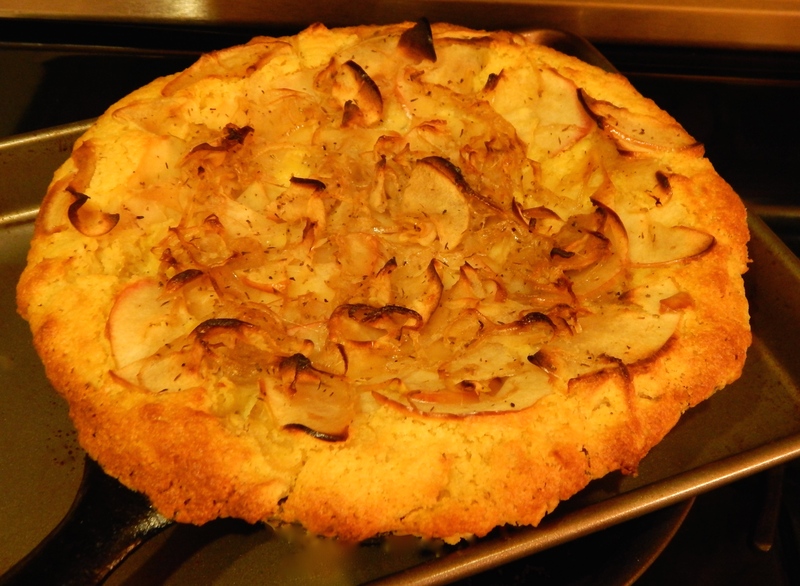 Half the apples and onions were folded into the batter and half were reserved for topping the cornbread. It baked for about 45 minutes. The recipe was supposed to be for an 8 inch skillet. I used a 9 inch skillet and it still overflowed the edges. Thank goodness I had put it on a foil covered baking sheet, just in case. Side dish or dessert? It’s hard to know what to call this super moist, rich, savory/sweet cornbread. The apples, onions and thyme were a savory delight on the palate. The cornbread was almost as sweet as a cake – a little too sweet for my personal taste. I think I’ll make this another time, but with my usual corn bread recipe in which I use canola oil rather than all butter for shortening. Since half the apples and onions are folded into the batter, it will still have some sweetness. And, I’m thinking, stirring in some crispy chopped bacon wouldn’t be a bad thing. I’ll let you know when I experiment again. The headline says Sunday dinner at the doublewide. In addition to the cornbread, I pan browned and oven finished center cut pork loin chops and fried up the last of the green tomatoes. The bowl of ‘maters I’d been planning on using are ripening quickly and I wound up with just two small green ones to fry. That was probably a good thing. Sunday dinner. 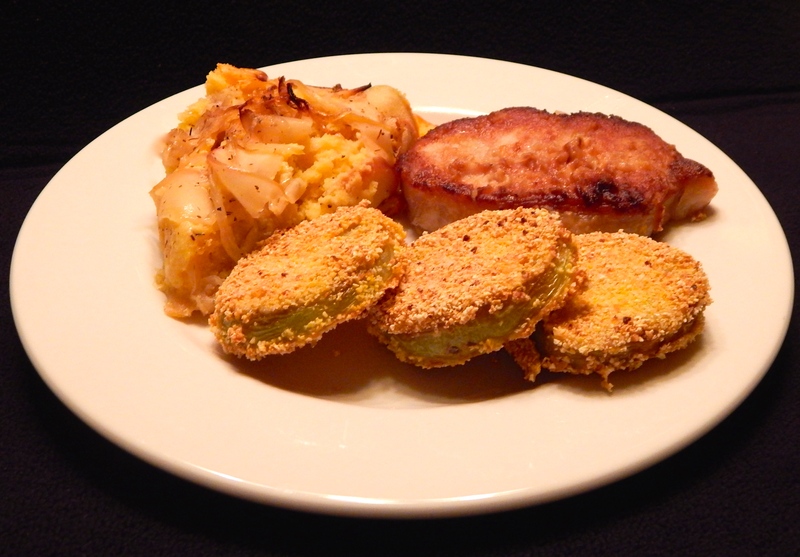 Cornbread with caramelized apples and onions, a pork loin chop and fried green tomatoes. Monday will be a day of repentance with dinner at the salad bar. Haven’t been down to the doublewide in a while. With cool weather is settling in, there’ll be some hearty comfort foods cooking there for sure! Pot pie is a fall and winter favorite. Pot pie can be be made from just about anything in the fridge, freezer or pantry. My mother never put vegetables in her chicken pot pie. Her’s was all chicken and a creamy white with biscuits baked on top of the filling. Forgive me, Mom, but I like vegetables in mine. I find that you can get a great surprise by experimenting with different veggies in the mix and even with different toppings. 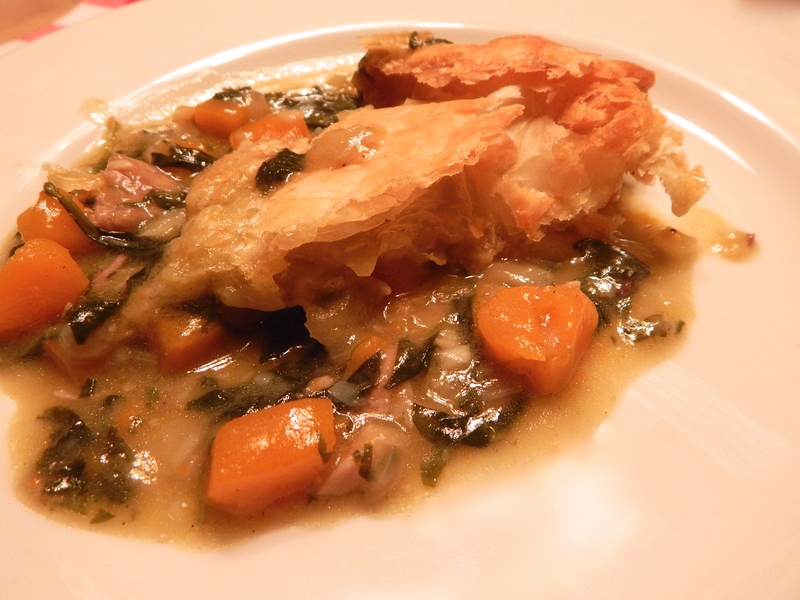 For instance, spinach and butternut squash topped with puff pastry! Pot pie with a puff pastry crust cooked in a cast iron skillet. If you look close, you can see the skillet handle, even on the black cast iron stove grates. I have a couple of old cast iron skillets. One is my sacred corn bread pan that once belonged to my step-grandmother. It has always been used only for cornbread and woe be to anyone who even thinks of using it for anything else! The other one is for experimenting and trying out new recipes. Both are so well seasoned that they are slicker than Teflon! I cooked the filling in my cast iron skillet. It started with chopped onion followed by garlic in a little olive oil right on the stovetop. When they were ready, I added about a teaspoon of ground sage and let it bloom for a moment. Next, I added roughly chopped spinach and wilted it on the onions – three big handsful before chopping. Next, I sprinkled on a generous quarter cup of all purpose unbleached flour and stirred and cooked it for four or five minutes to make a roux with the savory vegetables. Then, I stirred in two and a half cups of chicken stock made when I cooked chicken thighs for the pie. When the roux and stock were blended, I added half a small butternut squash, peeled and cut into a 1/2 inch dice – roughly a heaping cup and a half. The stock thickened as the squash simmered, covered, and softened in about 15 minutes. 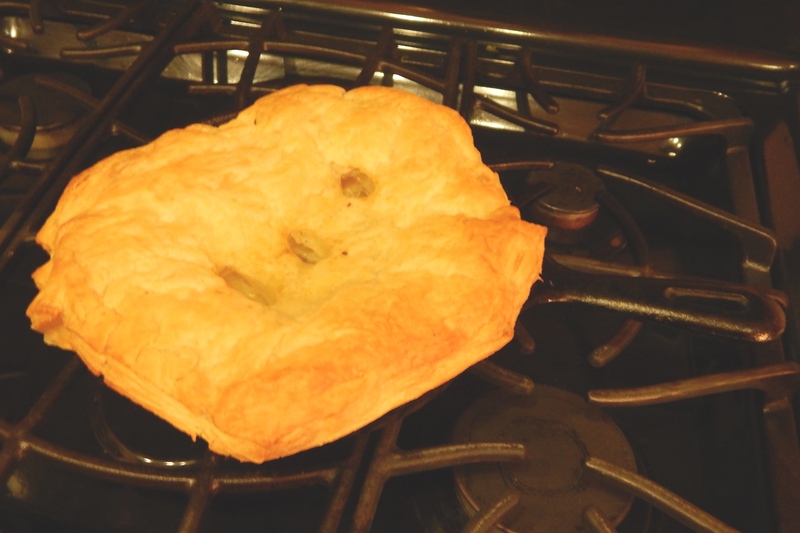 I stirred in the chopped meat from two chicken thighs and topped the skillet with a sheet of puff pastry. The pastry got a rough trim hanging over the edge of the skillet. After poking a trio of steam vents into the pastry, the pie went into a 425 degree oven for 12 minutes until the crust began to brown. I reduced the temp to 375 and let the crust finish rising and baking for another 12 or so minutes to a golden brown crispy, flaky delight. I let is rest for about 10 minutes and dished up a plate of savory goodness with a hint of sweet from the squash. There were no leftovers. I can’t wait to make it again with a regular pie dough topping! Chicken and butternut squash pot pie with a puff pastry crust. Good eats at the doublewide! Second Saturday morning at home since Memorial Day! Calls for a celebratory breakfast. 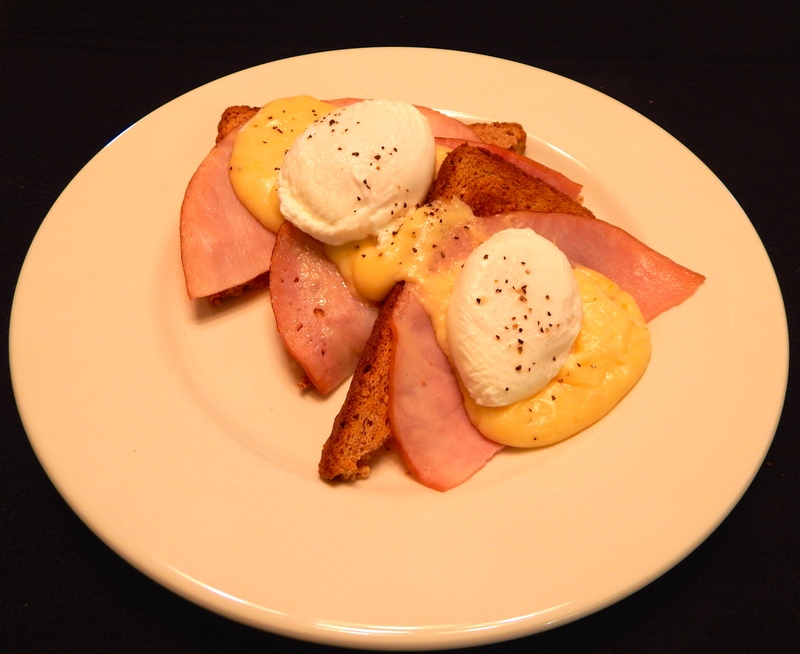 Simple but special breakfast: Toast points, thin ham slices a béchamel-based cheese sauce and poached eggs. Lipitor, anyone? No green chile! That’s unusual for a cooked breafast around here. It begins with a base of mult-grain toast points topped by thin slices of ham. A béchamel-based cheese sauce enriches the overall flavor. Poached eggs with a light sprinkle of ground black pepper and kosher salt top it off. Delicious, with a couple of nods to healthful using 2% milk in the béchamel, lean ham and the 15 grain bread. First freeze warning last night in the borderland. Sunny afternoon with a chill wind made me want a hot pot of something for dinner to ward off the cold. Inspiration started with a bowl of roasted and peeled green chiles in the refrigerator. 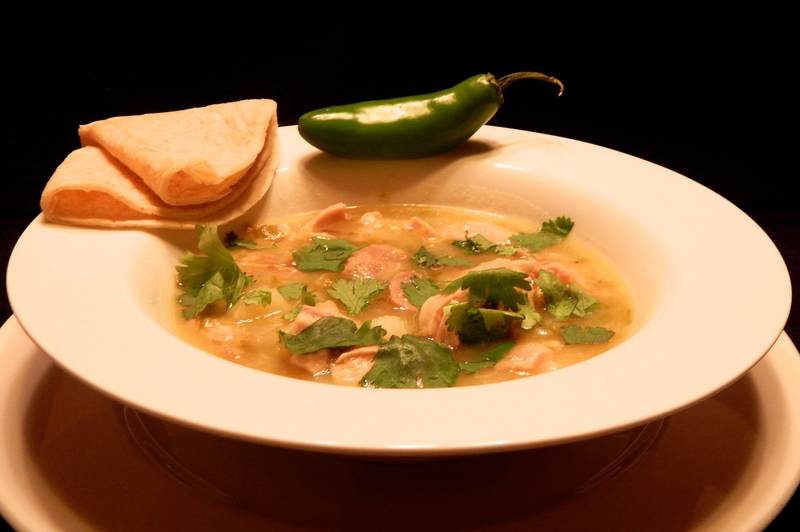 The toss up was between chile verde con carne (green chile with meat) or green chile chicken soup. Chicken soup with green chile and a serrano pepper garnish for a little extra heat. The winner was green chile chicken soup. Onion and garlic sweated in the pot, skin on chicken thighs lightly browned with the onion and garlic, then a long simmer in a broth enhanced by Better than Bullion chicken base. The cooked thighs were set aside to cool and chopped green chiles and peeled and diced potato added to the pot. While the potatoes cook, skin and meat were removed from the thigh bones. When the potatoes were done, about half were mashed in the pot to thicken the broth. Then the chicken went back into the pot and all was brought up to temperature. The last few batches of green chiles have been unusually mild so it takes several to up the taste. I used a serrano pepper both as a garnish and a little extra crunchy heat. A sprinkle of cilantro leaves and a couple of corn tortillas with a dab of butter finished off a spirit warming dinner. Curried Mussels. Don’t be fooled by the small serving. I had three bowslful and later picked at a few left in the pot. My market didn’t carry mussels in the summer – those months without an r. Their frozen muscles were gone before the end of May. It was a long summer without those tasty morsels. When I went shopping yesterday afternoon, there were none in the fish case. I asked if there were any in the back. John went to check. If you are good to the meat market guys, they are good to you! I am always good to the meat market staff! John brought out a new box, opened it and hand picked a pound and a half for me. He did very well. Only two of sixty-something mussels didn’t open. I made a broth of sautéed leeks, garlic and unsweetened coconut milk with Madras Curry. The curry was mild, even though I doubled the recommended amount. It made a deliciously rich broth. 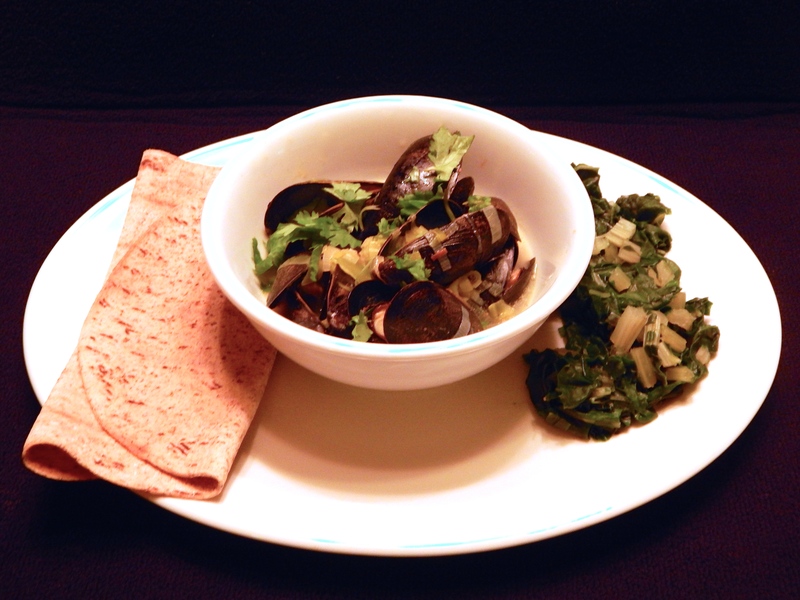 A chopped cilantro garnish was the right touch for the mussels and curried broth. Next time, I’ll use a more potent green curry power from my arsenal. Since my grocery had no naan, I served a thin flatbread instead. Steamed chard was a satisfying side for the mussels. I’ve been reading about spatchcocking and decided to give it a try. This adventure has lead me to create a new blog category – The Gringo Gourmet Academy. I’ll be sharing new techniques I’ve picked up from magazines, television and friends. I’d appreciate comments about the techniques when they appear, and links to readers’ experiments with new ways to achieve good food. The first Academy posting is about spatchcocking. 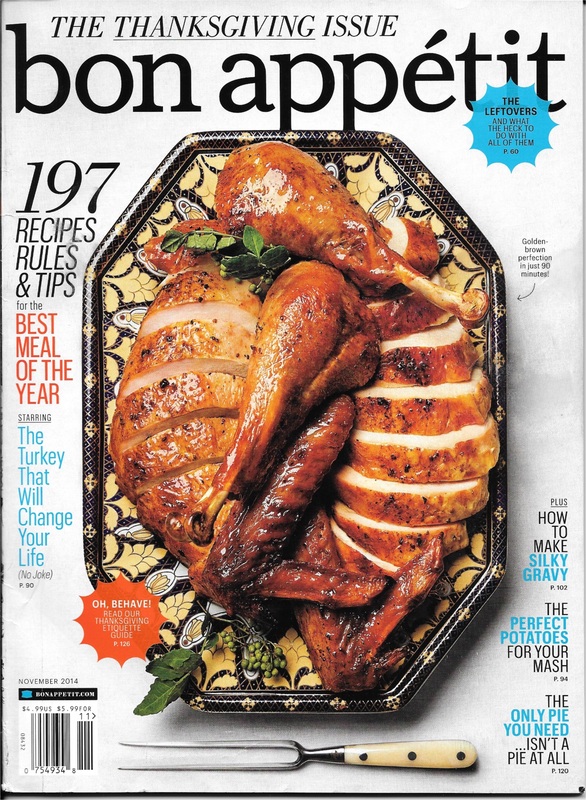 The Nov. 2014 issue of Bon Appétite magazine has a cover photo of a spatchcocked turkey that intrigued me and made my fingers itch to get into the kitchen and try it. Fortunately, the photos is accompanied with an article and instructions on the technique. 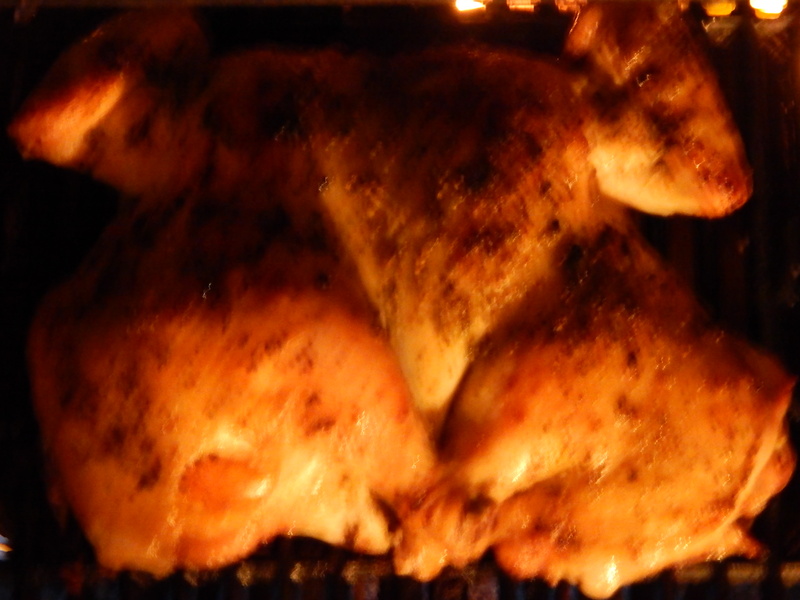 a chicken or game bird split open and grilled. informal, chiefly Brit. add (a phrase, sentence, clause, etc.) in a context where it is inappropriate: a new clause has been spatchcocked into the bill.ORIGIN late 18th cent. (originally an Irish usage): perhaps related to the noun dispatch + cock1, but compare with spitchcock. Spitchcock, by the way, refers to splitting and frying or grilling an eel. My preference is to go with the poultry version. I decided to try spatchcocking a chicken for the first time instead of a whole turkey. The the technique is basically removing the bird’s entire backbone with a chefs knife or kitchen shears; turning the bird over and scoring alongside the keelbone (breastbone) to make a shallow grove. Once the surgery is done, splay the bird, breast up and press firmly on the breast until hear the keelbone crack and feel the bird go flat. You might think of it as butterflying a chicken. Spatchcocked chicken with a meyer lemon and pepper rub and left to stand for 30 minutes. 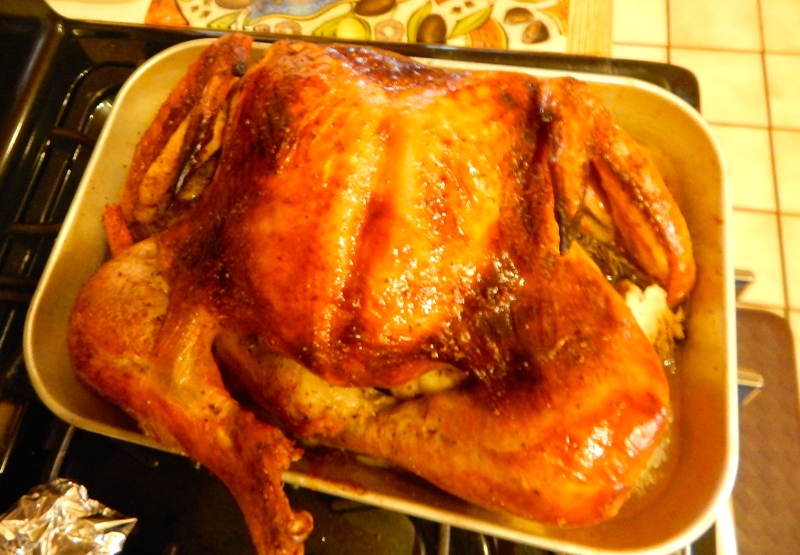 The turkey recipe roasts the bird for 30 minutes at 450 and then reduces the temperature to 350. The turkey then is rubbed every 20 minutes with an herbed oil until a thermometer in the thickest part of the thigh reads 165. 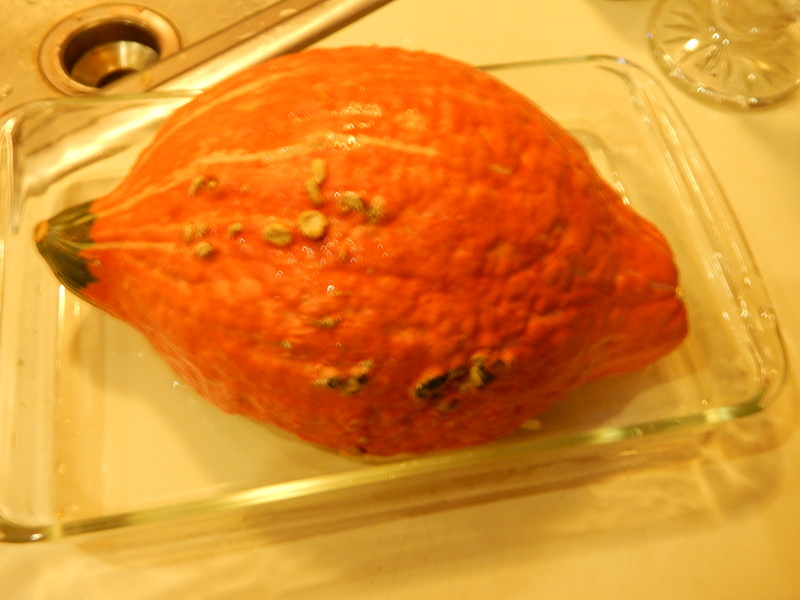 After it is removed from the oven, it rests for 30 minutes before carving. It says the skin is super crisp and worth the whole process. I transferred my chicken from the foil lined pan above to a 400 degree gas grill. I used a water filled drip pan below the bird to add moisture and catch the drips that otherwise would have caused flare ups. I didn’t baste mine; nor did I time it. I did use a thermometer to check the internal temp. Getting golden on the grill. Smelling so good I can hardly stand to let if finish cooking. One of the things that attracted me most to the spatchcock article was the carved presentation of the turkey. When I plated my chicken, I cut the bird in half. One half is compete on the plate. Carving the other half, I removed the wing, separated the thigh and leg and removed the complete half breast in one piece from the ribs. I then sliced the breast crosswise. We got a choice of dark and white that way and still have a half chicken for another evening or another recipe. 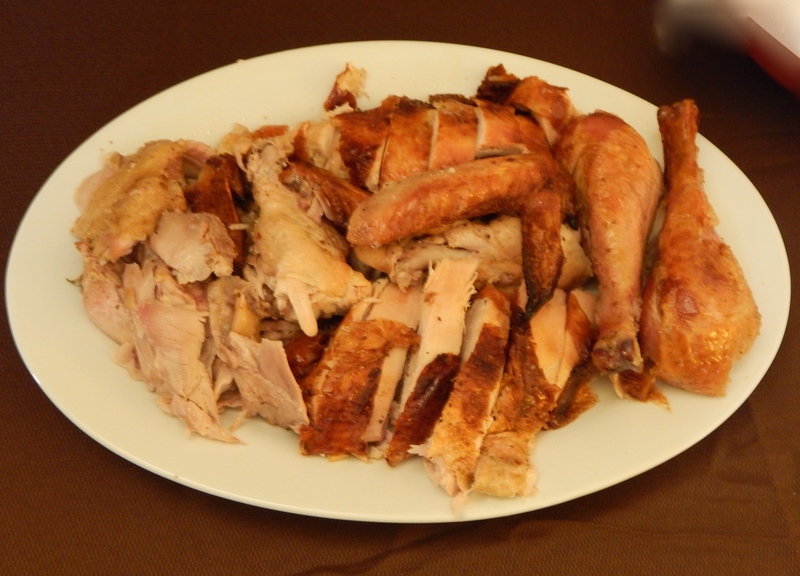 For comparison below, here’s the magazine cover and the plated spatchcock turkey. See why I had to try it? I served roasted brussels sprouts tossed with caramelized onions and splash of apple cider vinegar as a perfect Fall accompaniment to the juicy chicken. 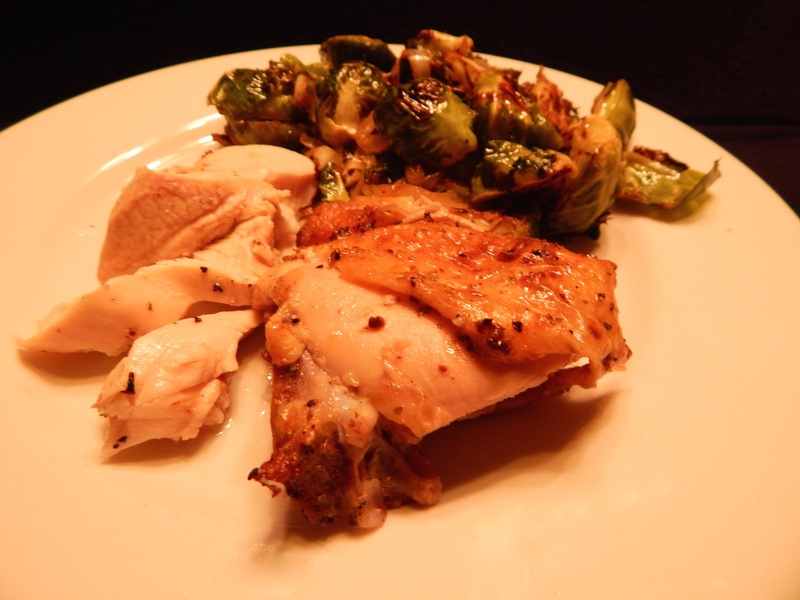 Tender juicy spatchcock chicken and savory roasted brussels sprouts with caramelized onions. Lessons learned at the Gringo Gourmet Academy. I cooked my chicken with ankles demurely crossed. The chicken leg was a little more pink at the bone than I like. Upon checking back with the magazine, I found that they roasted the turkey with legs splayed outward. I’ll be doing another chicken soon to see if that makes a difference. It should allow more heat to get to the leg’s interior. I’m hosting Thanksgiving this year. I’m seriously wanting to spatchcock the turkey. Let’s see if that happens, or will I chicken out? Bev, a Master Gardener friend gave me a Boston Marrow Squash and challenged me to do something with it. She told me that the squash is used in canned pumpkin pie filling, so I figured’ why not? 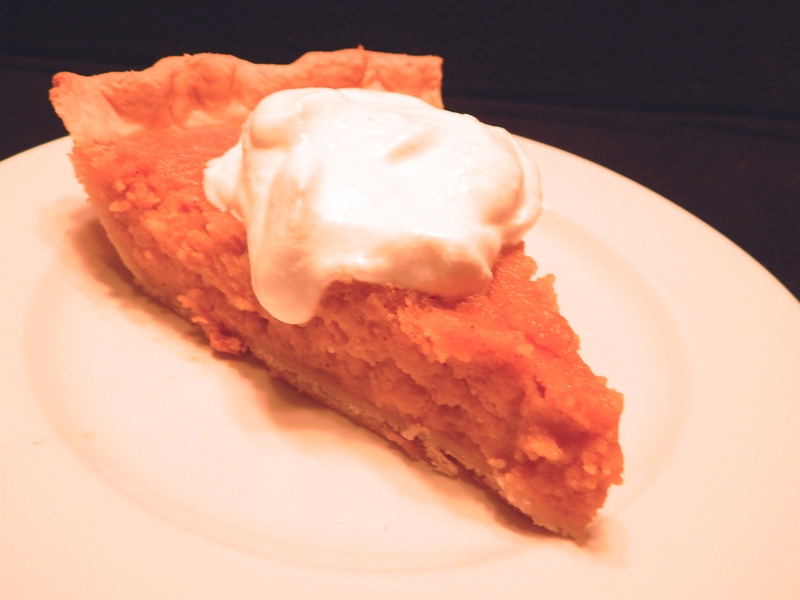 I had discovered a buttermilk pumpkin pie recipe in a magazine and the course was set. The squash starts out about the size and shape of a football. My friend said she roasted hers for about an hour. I halved mine and microwaved each half for about 20 minutes. The squash skin is very tough. I had to use a cleaver and my 10 inch chefs knife to cut it. I really think the empty shell could be used in construction of bicycle helmets. It takes sharp tools and some leverage to slice a Boston Marrow. Half the in a 11-3/4 X 7-1/2 Pyrex baker. I added 1/4 inch of water, covered it with plastic wrap, punched a few steam vents in the wrap and zapped it on high for about 20 minutes. The skin is so tough that I had to flip the squash to see if it was done. I couldn’t pierce the skin with a meat fork! 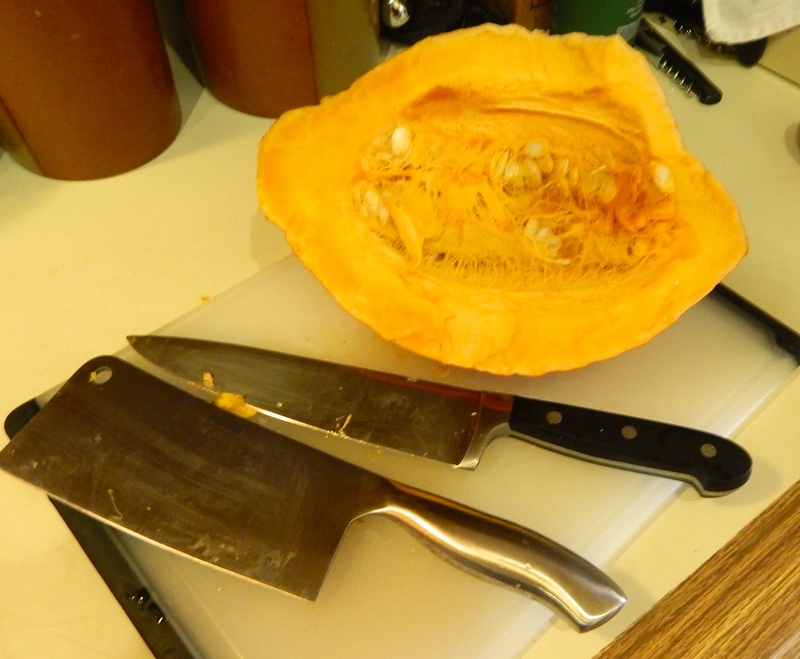 The whole squash yielded about 1.75 quarts of flesh when cooked – 3.08 lbs. by my electronic scale. Despite my less than perfect crust crimping, The result was a very good pie, a bit sweet for my taste And although the recipe called for sprinkling the top with powdered sugar, I prefer my pie mit schlagobers (with whipped cream). This pie was quite an adventure as you can read below. TRUE CONFESSIONS OF A COCHINERO IN THE KITCHEN: In Spanish, a cocinero refers to a cook from the word cocina or kitchen. I can be messy in the kitchen, so I sometimes refer myself as a cochiner0 (messy or dirty) from cochino. a not to flattering word for dirty. I baked two pies. Per recipe instructions, I baked them on a rimmed baking ban. When I pulled the oven rack out to test the first pie, it needed a few more minutes. I started to slide the rack back into the oven and it jammed and stopped. The pie didn’t. It fell off the rack into the back of the oven. The air in the kitchen turned blue with my expressions of displeasure and shock. A very cochino accident. After the oven cooled off, I removed the gooey mess. In the interim, I pulled out the operators manual and figured out how to use the self-cleaning cycle. What an amazing thing that is! After the cycle finished there were just three or four tiny spots of gray ash that blotted up with a paper towel and the oven looks like new again. My range has double ovens. I use the upper one most of the time. When I use the bottom one, it can be a challenge getting things in and out without kneeling or sitting on the floor. Something of a hassle for a guy who is getting “mature.” Still, I love the gas range especially at those times when having two ovens is a great convenience. 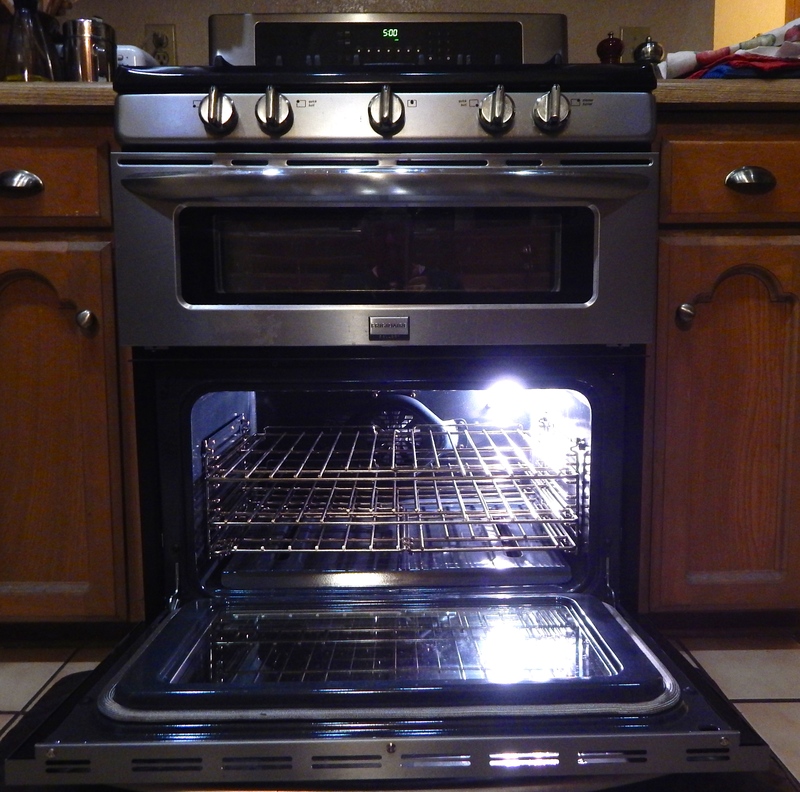 Cleaning cycle complete, my lower oven is showroom shiny again. In spite of the oven accident, I enjoyed experimenting with the Boston Marrow squash. 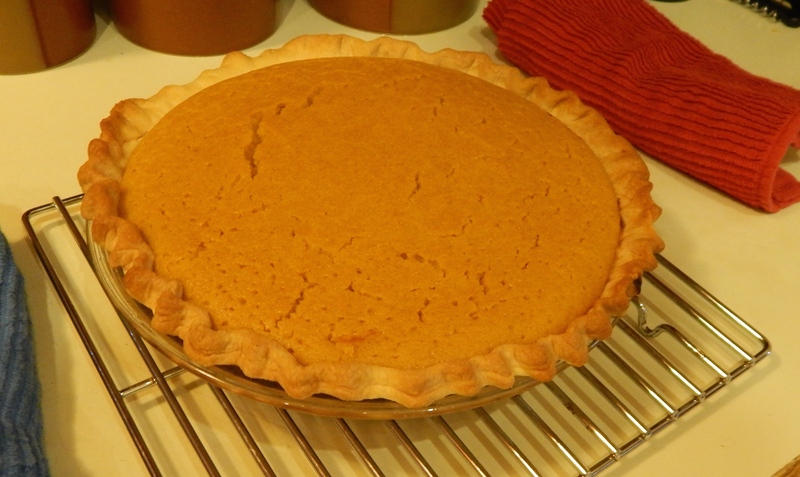 I’ll try the buttermilk pumpkin pie recipe again and see if there is a notable difference in the sweetness levels of the fillings. Preheat oven to 375. Put a rimmed baking sheet in the oven to heat while you make the pie filling. Whisk the pumpkin puree, melted butter, eggs, brown sugar, granulated sugar, allspice and cinnamon in a medium bowl until well combined. Add buttermilk and flour and whisk until smooth. Pour into your crust (I used a ready-made crust from the supermarket dairy case). Put the filled pie on the hot baking sheet and return the sheet to the oven. I cover the edges of the crust with strips of foil to prevent over cooking or browning. Bake until the filling is set, 50 minutes to an hour. The top of the pie may crack slightly. Dust with confectioner’s sugar just before serving. The text of my squash pie was not as firm as pies I’ve made with canned pumpkin. It still held its shape when cut. If you use a scratch made crust, treat it as you always do for pre-baking or not. The ready-made crust I used did not need to be pre-baked before adding the filling. It is November, already! Nights are cooling down. Days have been damp and blustery. It’s time for comfort food to warm the body and the spirit. I couldn’t decide between making a chipotle infused tlalpeño soup or a more common tortilla soup last night. The simplest thing was to take the best of both and combine them into one meal. Both soups feature chicken. Usually the chicken is simmered in broth, then diced or shredded. I like to use chicken thighs simmered whole and skin on for flavor. I do remove as much solid fat from the thighs as possible before browning them for color and to start my broth base. 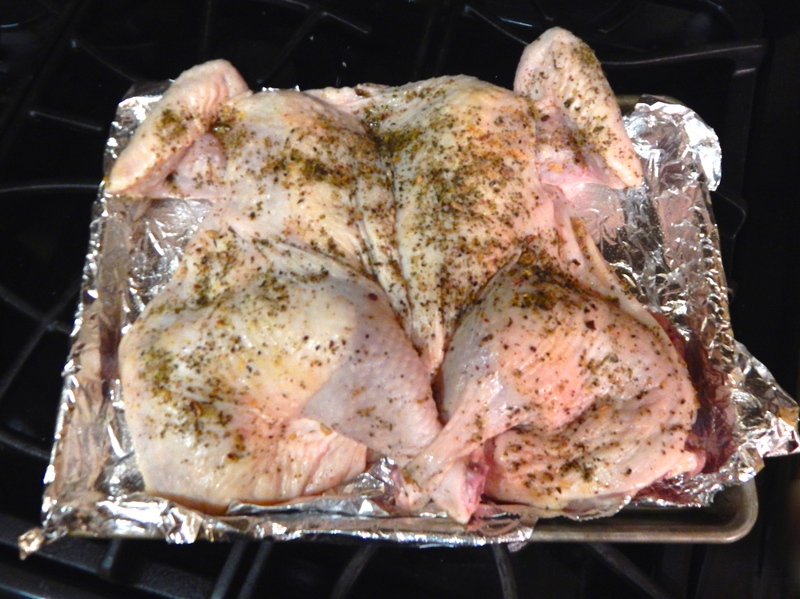 After the thighs are browned, I remove them and sweat onions and garlic in the rendered chicken fat. Last night, after the onions were soft and translucent, I added fresh corn kernels from an ear of corn and let them brown a little. Next was a can of no salt added petit diced tomatoes. I returned the thighs to the pot and added lower sodium chicken broth to cover them and let this mix simmer about 20 minutes until the chicken thighs were done and tender. Next diced Mexican and yellow squash were added to the pot with a little more broth. I add the squash toward the end of cooking so it retains a little texture. A couple of minced chipotle chiles and a two or three teaspoons of adobo sauce from the chiles were added and it all simmered a little more to impart the wonderful heat and smokey undertones of the chiles to the soup. I plated it as I would a traditional tortilla soup. 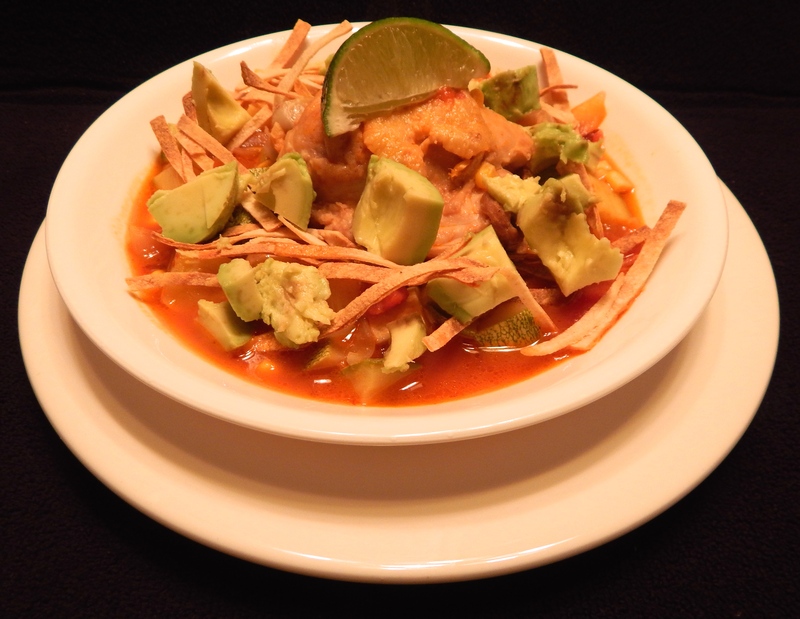 I used oven browned tortilla strips on top of the soup and placed a whole thigh in the center of the bowl. A slice of lime and diced avocado were the tlalpeño touches at the end. Shredded cheese would have been good, but I didn’t do cheese last night. The result was a hearty soup with hints of two favorite dishes and a blend of flavors that required second helpings all around.